The HDC-4800 incorporates a 4096 x 2160 pixel Super 35mm CMOS sensor to take advantage of PL mount lenses for live sports shooting. It also supports B4 lenses via an optional adaptor for HD production. A motorised dual ND/CC filter can be operated remotely to allow variable exposure control. Wide colour space (BT.2020 and BT.709) is supported in the current model. HDR support using an S-Log3 gamma curve also comes as standard. The HDC-4800 networks with Sony’s HDC series cameras, with matching colorimetry and a wide range of adjustment. Both systems take advantage of existing build-up kits, remote control panels, master setup units and viewfinders. The BPU-4800 is a matching unit that connects to the HDC-4800 via SMPTE optical fibre cable for 4K high frame rate (HFR) signal transmission and simultaneous high-quality XAVC recording. Storage within the BPU-4800 allows up to four hours of continuous 8x super motion 4K capture without requiring any connection to a live server. The HDC-4800 captures full-resolution 4K UHD images at up to 400p or Full HD at 800p (16x). Also accessible in the BPU-4800 is a 'Share Play' mode with the PWS-4500 multi-port 4K/HD live server connected with a dedicated IP network. A typical system configuration comprises one or more camera heads, BPU-4800 main signal processor, remote control panel and motion effects controller plus an HDMI-connected monitor which functions as the GUI display. 4K shooting for HD delivery is currently common practice and the same principle can be applied with the HDC-4800. During replay, 4K content shot in 4K on the HDC-4800 can be cut out and moved around an HD frame within the 4K slo-mo. That's a general outline. How does it translate into a working system? At this price point one is entitled to expect impressively good performance, uncompromising build quality, easy maintainability, intuitive operation and good documentation. The HDC-4800 delivers in all five respects. First the performance. The camera conformed fully to specification not least in terms of optical sensitivity. One caveat which applies to any slow-motion camera is the need to ensure good lighting when shooting at high shutter speeds. At normal speed, all is fine. The build quality is excellent, highly robust both externally and internally, with a commendable uniformity of components right down to board level. Spares availability is good if or when replacements are needed. Sony runs a very efficient online ordering service for spares with typically two to three days delivery time for parts. Maintenance access is straightforward but, it should go without saying, anything more ambitious than superficial cleaning is best left to experienced service technicians. A useful diagnosis menu is provided for checking factors such as board status, ROM version, camera input voltage, camera current consumption and the length of the cable connecting the camera to the control unit. Routine maintenance from an operator's viewpoint is entirely a matter of menu configuration. Setup functions such as white shading, black shading, hue matrix, auto iris, microphone level, tally, output configuration, date/time and battery alarm trigger are all easily accessed via a clean and simple maintenance menu. Or for simplicity, just select auto setup and execute auto black, auto white, auto level and test functions. A versatile of iris, lens, and tally modes can also be checked or adjusted. Paint parameters are controlled via a separate menu giving access to settings such as video levels, colour temperature, gamma, saturation, knee, white clip, detail, HD detail, 4K detail and skin tone detail. Also controlled via this window are shutter speed, noise suppression, flicker reduction and HDR setup. The HDR subset gives access to HDR mode, SDR gain, HDR contrast, HDR black offset and HDR knee/point/slope. Paint data scene files can be saved to internal memory and instantly recalled. 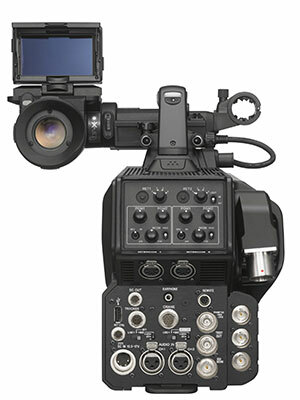 The HDC-4800 has a very similar setup and control style to other broadcast-quality cameras in the Sony which allows operators to move across from one to another without needed to readjust their brains. Practically all the features can be accessed, adjusted and operated easily through an intuitive menu system. Operators moving across from other camera brands should obviously read the documentation and do some trial shooting before heading out on a major project. The user manual is well written and excellently presented, including all necessary diagrams. As always these days, a copy of the user manual can be downloaded as a PDF in case the printed original goes astray. In summary, an excellent camera system well matched to the needs of today's HD world while at the same time being 4K future proof.